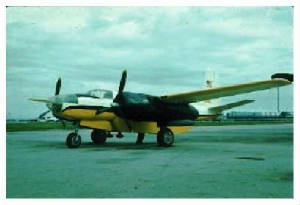 Bomber, night fighter and ground attack aircraft, just some of the roles the A-26 Invader played during WWII. 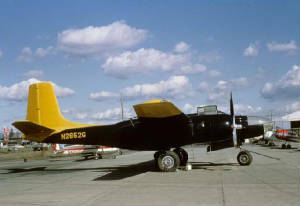 Then the period after the end of World War II saw a rapid growth in the use of this exact same aircraft for yet more diverse duties in civilian use. An aircraft that could be utilised to fit the growing need for agricultural and specialist aircraft in the general aviation market. 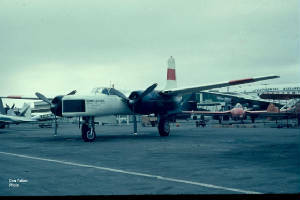 As the A-26 Invader was ideal as a single pilot aircraft and with the abundance of cheap spares, the Invader saw service yet again as a muti tasked airframe, that was fully adaptable to suite any use. Below are just a few examples of how the Invader was utilised or "hired out" to undertake these various operations. For history and data on individual Invaders throughout the site, I would like to credit the Warbirds Worldwide Directory by John Chapman, thank you John. The spray equipment can clearly be seen on the trailing edge of the wing. The above shot is from the Bill Larkins archive. Go here to visit his site. Dollar Lines Inc, San Francisco, CA. Pacific Flight Service Inc, Angwin, CA, 1964-1969. Arthur W. McDonnell, Lancaster, CA, Nov. 1970-1975. 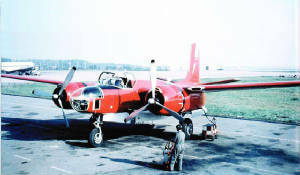 - Operated with fog dispersal gear, 1969-1975. Stencel Aero Engineering, Ashville, NC, 1977. Oklahoma Aircraft Sales, Yukon, OK, 1984. John McGuire, El Paso, TX, 1986-1987. 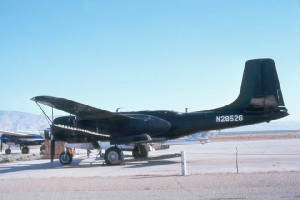 John MacGuire/ War Eagles Air Museum, Santa Teresa, NM, Feb. 17, 1987-2002. * Clarification: I had a great mail from Carl Jenkins regarding N2852G. Hi, I'm Carl Jenkins. Just signed your guest book. I've been enjoying your site for some time now. Noticed you have a new area "drug runners" and noticed the WEAM A-26C 44-35493 N2852G was missing. Thought I'd fill in another blank. 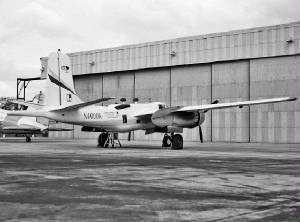 Here are 5 pics of '493 I took on the impound ramp at NAS New Orleans 11Sep1981 during a fuel stop. 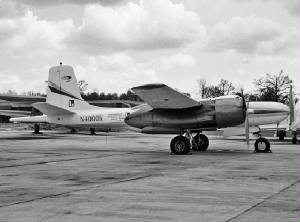 '493 kinda stood out amond the other airplanes . Asked a DEA man if he would mind me crawling over the plane and the answer was, "...go ahead I think we've cleaned her out". 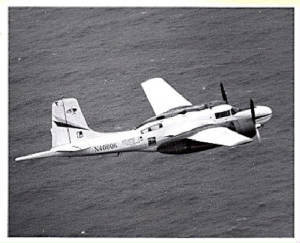 The story was '493 was blasting up the Texas-Louisiana coast at a very low altitude and a high rate of speed. A couple fast movers out of Ellington caught up with her outside Grand Isle, LA. The bomb doors opened and the load of pot dropped into the gulf. He was escorted to NAS N.O and landed without any further opposition. This took place the last week of August 1981. I was fortunate enough to be passing through a week later and got these pictures. 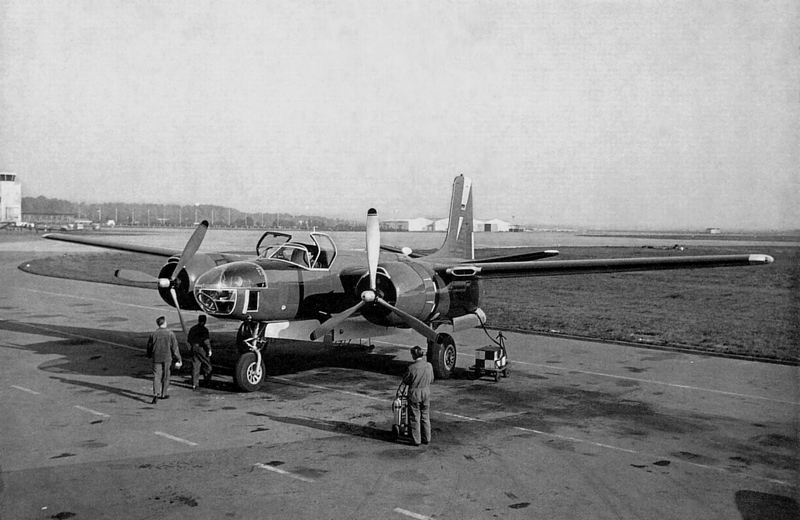 RB-26C 44-35622 first civil registered N9658C was then registered as the D-BELE on 4/3/1962, after which it was registered on 27.6.1962 as the D-CELE and flew with Prakla Seismos AG and was used for survey work in Africa. Understood to have been used/owned by the PRAKLA / BND German Secret Service, but not confirmed. 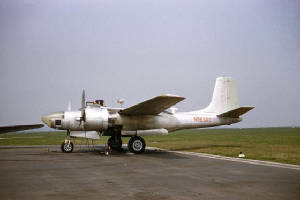 To civil registry as N7824B, then was registered as D-BELI on 06/03/1963 in the name of W. Rall and was re-registered as D-CELI on 03/27/1963 in the name of Photogrammetrie München GmbH and was used for aerial reconnaissance and research on mineral resources in the Middle East. 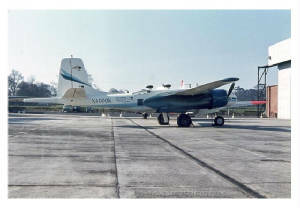 Note regarding the above two aircraft: Both aircrafts (c/n 28901 and 28917) were at first registered D-BELE and D-BELI resp. 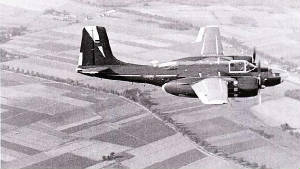 The “B” was for aircrafts between 14 t and 20 t TOW. 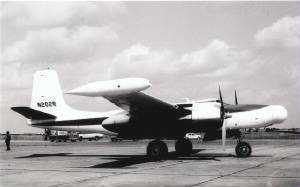 At 4.3.62 and 27.3.62 resp., both aircrafts regs. Were changed to D-CELE and D-CELI. 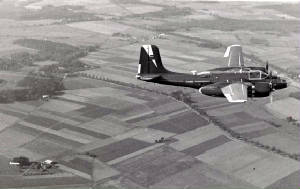 “C” stands for aircrafts between 5,7 t and 14 t, because these RB-26C’s without weapons, ammunition and armour fourteen tons was enough, even when carrying full fuel load. 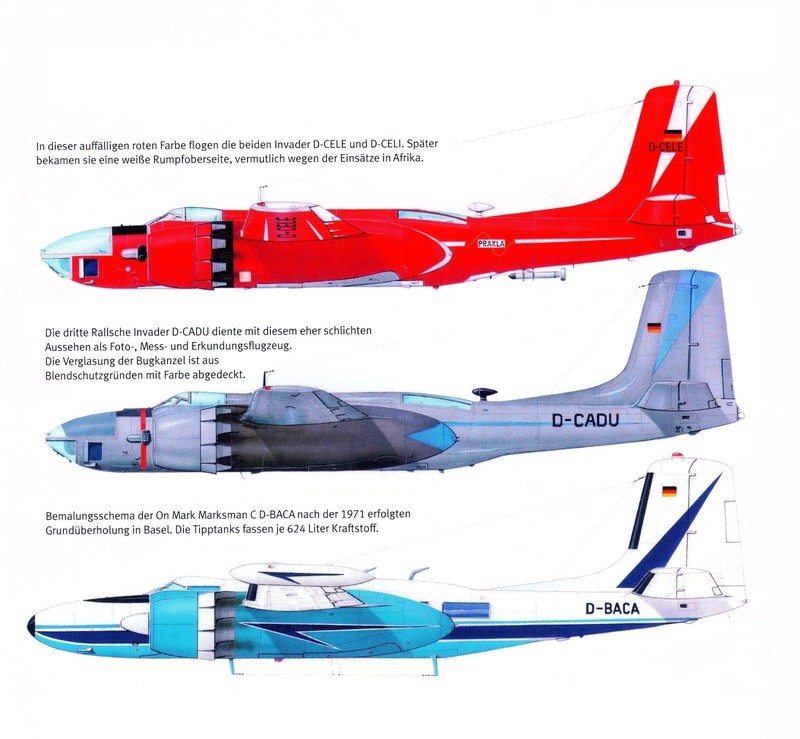 Generally: The owner of D-CELE, D-CELI and D-CADU was Walter Rall and the aircrafts were operated for the survey companies PRAKLA Seismos AG, Hanover and Photogrammetrie München GmbH. There were also contracts from time to time for the West German Luftwaffe Test Establishment 61, Manching and some secret and clandestine jobs for the German Federal Intelligence Service BND. 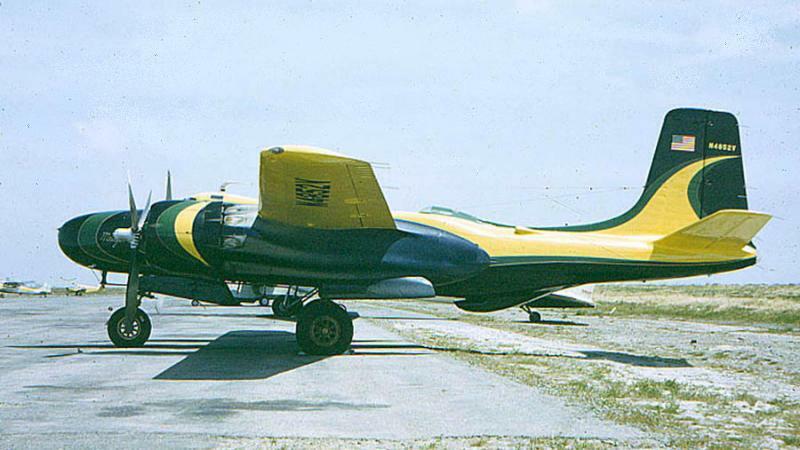 The above shot owned by Barrie Colledge is of Manila based Aero Service Corp Douglas A-26B Invader N4000K (c/n 28041) at Darwin in 1969 for a mapping contract of Irian Jaya. 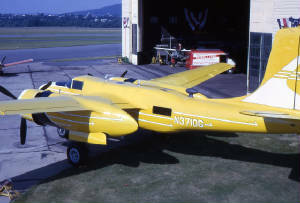 Swiflite Aircraft Corp, New York, NY, 1954. 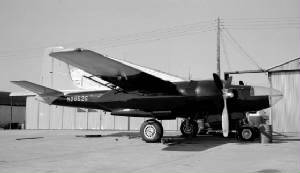 - Converted by Wold Corp to B-26 Invader Executive. Earl Slick/Slick Airways, San Antonio, TX, 1956. Aero Service Corp, Philadelphia, PA, 1963-1966. 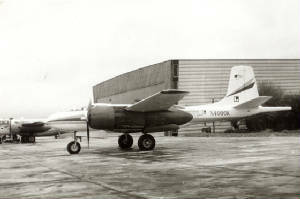 Aero Service Corp, Manila, Philippines, 1969-1972. 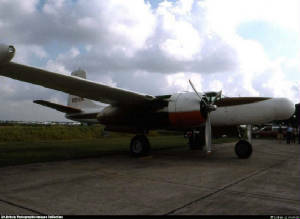 - Damaged during wheels up landing, Manilla International Airport, July 4, 1972. Withdrawn from use and abandoned, Dili, Portuguese Timor, 1975-1986. REMARKS- RT MN GR WOULD NOT RLS FM UP-LOCKED POSIT DUE TOMISG CLEVIS PIN AT RELS ROD ATTACH PT. Delivered to Reconstruction Finance Corp for disposal, 1945. - Never delivered to USAF. Superior Oil Co Inc, Lafayette, LA, 1950-1952. H.L. Brown/Brown Paper Mill Co, Monroe, LA, 1852-1954. 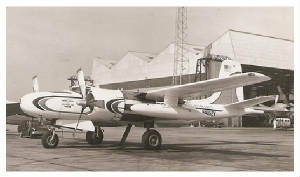 - Converted to pressurized executive configuration by Grand Central Aircraft, Glendale, CA, 1952-1953. Jonnell Leasing Corp, Dallas, TX, 1963-1964. Coastways Associates Inc, Miami, FL, 1965-1970. - Mineral survey operations, Liberia & Dakar, May 1965. 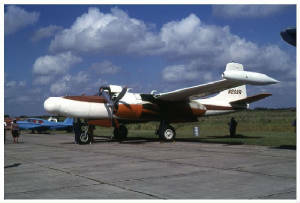 - Equipped with tail magnetometer boom & underwing fuel tanks. - Marked with title Minn Aerial Survey. - Based Luton, July-Aug. 1966. 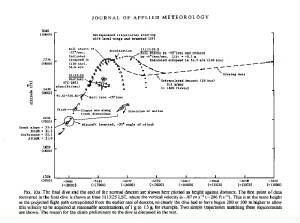 -- Marked with titles Hunting Geology & JMC Aero Associates. 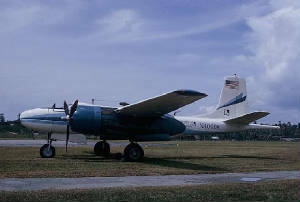 Previous history: In December 1964, A-26 N4852V (serial 28047) of Coastways Associates Inc. of Washington left the US for a trilateration and photo mapping survey in Liberia on behalf of the Army Map Service; later this survey was extended to areas in Southeast Asia on behalf of Gulf Oil Company. 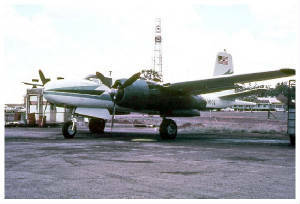 In mid-April 1967, during the final phases of a survey operation, A-26 N4852V encountered mechanical difficulties at Jesselton on Borneo to an extent that neither returning the aircraft to the US for repairs nor completing repairs abroad was economically practical so that Coastways wanted to scrap the aircraft. 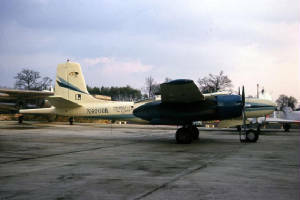 Between 17 and 20 April 67 and between 18 and 22 May 67, Air Asia sent an aircraft down to Jesselton to pick up the aircraft and ferry it to Tainan, where it was stored until January 68. 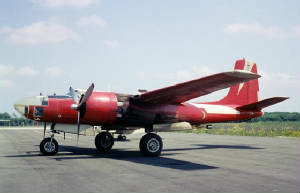 As part of the payment, Coastways decided to sell the aircraft to Air Asia, asking permission to do so in their letter dated 23 July 68, sent to the Office of Munitions Control, US Department of State. In that letter the status of the aircraft is described as follows: "The aircraft has been stripped of its electronic, and most of the communications and navigation equipment, which was shipped back to the United States. The hull and engines are currently in dead storage at the facility of Air Asia Company, Limited (AACL) at Tainan, Taiwan, and AACL has made us an offer to purchase the remains for scrap and salvage." 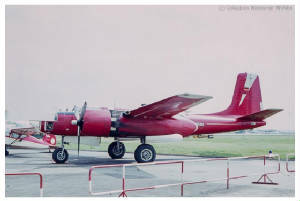 Air Asia bought the aircraft on 15 August 68. 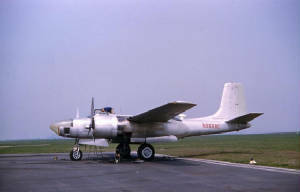 Service history: current at Tainan in 1970; white; to be seen in the Air America documentary, were it seems to have been used for technical training at Tainan; believed to be the A-26A owned by Air America / Air Asia according to the Inventory of 31 March 72, which is no longer mentioned on the Inventory. Fate: probably scrapped in 1972. 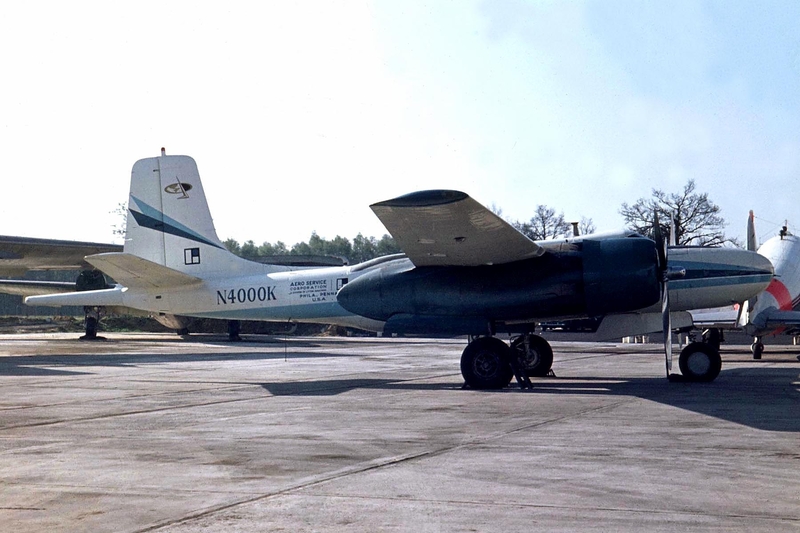 The above two shots sent in by Larry Green, were taken late 50's at Reading, PA. when she was converted to civil standards by READING AVIATION SERVICE. 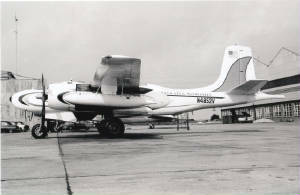 Reading Aviation Services, Reading, PA, 1961-1964. Photo File Surveys Inc, Philadelphia, PA, 1966. Aero Service Corp, Washington, DC, 1969-1972. Duane Egli, Fabens, TX, 1977-1980. 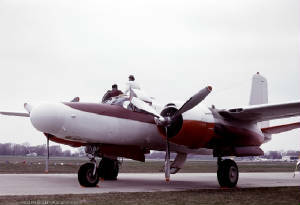 - Operated by Don Bullock/Cavalier Air Force, Biggin Hill. - Crashed and destroyed during airshow, Biggin Hill, UK, Sep. 21, 1980. 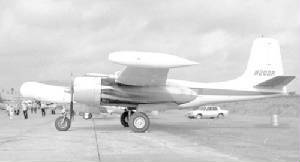 Charles H Babb, had special radar pod installed under port wing to detect oil deposits and later fitted with magnetometer under belly. 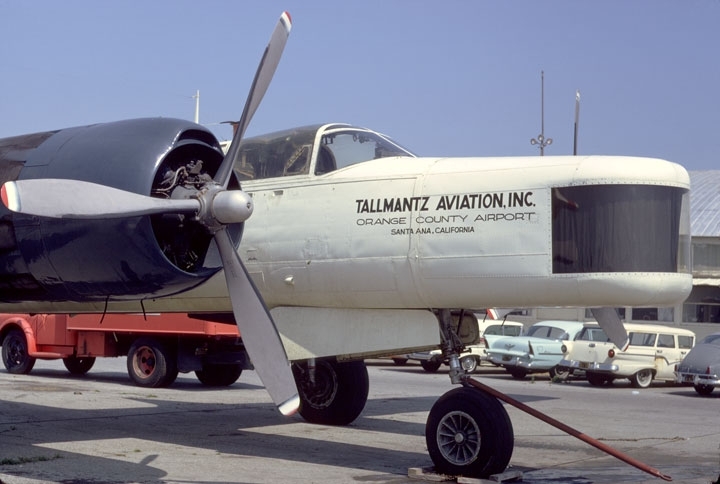 Tallmantz Aviation Inc, Orange County, CA, 1963-1976. - Modified with lengthened nose for Cinerama Cameras. 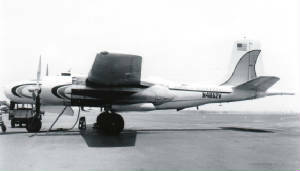 On Mark Aviation, Knoxville, TN, 1978. 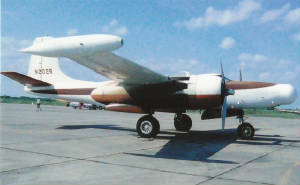 Sold, reported flown on drug run to South america, impounded on return to USA. John MacGuire/War Eagles Air Museum, Santa Teresa, NM, 1990-2001. 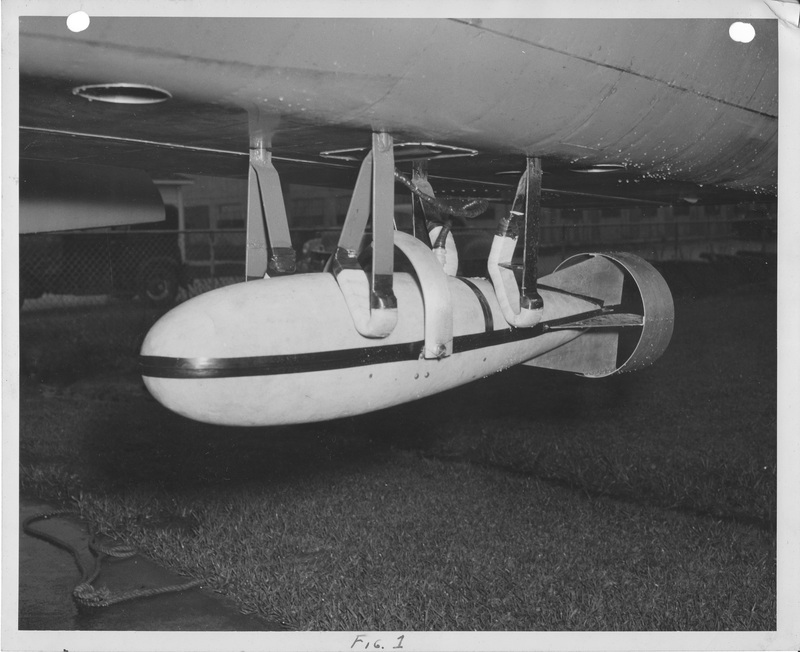 Charles H Babb, had special radar pod installed under port wing to detect oil deposits. On Mark Engineering Co, Van Nuys, CA. Western Contracting Corp, Lincoln, NE, 1963-1969. Texas Instruments Inc, Dallas, TX, 1971-1977. Edward G. Counselman, Topeka, KS, Nov. 1978-1984. USAFM, Linear Air Park, Dyess AFB, TX, 1984-2002. Metropolitan Paving Co, Oklahoma City, OK, 1963-1964. - Nose gear collapsed on takeoff, Oklahoma, OK, Jan. 28, 1965. Harry Mallory, Oklahoma, OK, 1966. Aero Industries Inc, Addison, TX, 1969-1970. Texas Instruments Inc, Dallas, TX, 1972-1977. Edward Counselman, Topeka, KS, 1978. Rodney G. Huskey, Grand Junction, CO, Nov. 1981-1995. 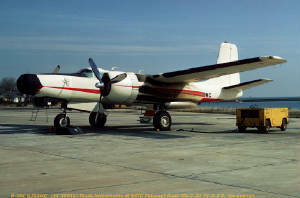 - Flew as USAF/44-35601/202/Miss Murphy. Lone Star Express, Grand Junction, CO, June 20, 1998-2002. 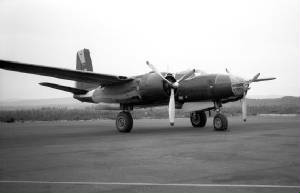 Delivered to French AF as 44-35345. - BOC: Feb. 16, 1954. 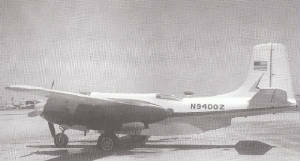 - Returned to USAF, Oct. 22, 1955. - Open storage, Clark AFB, Philippines, 1955-1958. Rock Island Oil & Refining Co, Wichita, KS, 1966-1971. - Converted to Consort 26, Hutchinson, KS. 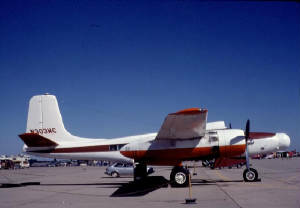 Aero Union Corp, Chico, CA, 1971. 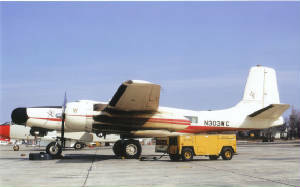 Conair Aviation Ltd, Abbotsford, BC, June 1971-1988. 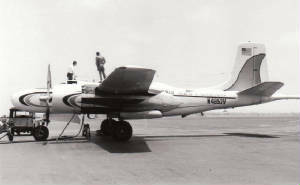 - Flew as tanker #325. 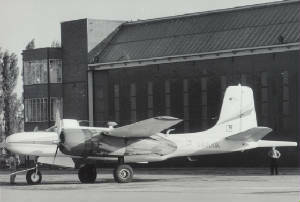 - Registered as C-FMSB, 1977. L.B. Smith Aircraft Corp, Miami, FL. 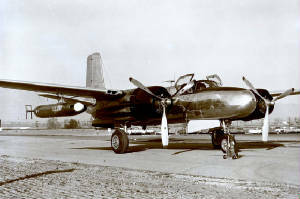 Delivered to USAAF as A-26C/44-35323, March 1945. - Delivered to ETO, April, 1945. - Returned to U.S.A., July 1945. - Transferred to 4185th Base Unit, Hill AFB, UT, Sept. 1947. 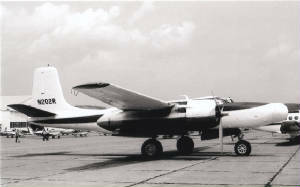 - Redesignated B-26C, July 1948. 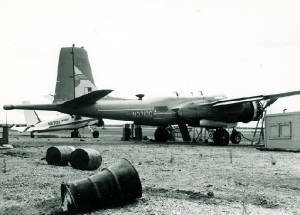 Tague Airbase, Korea, June 1951. 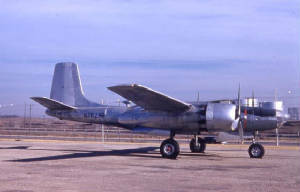 - Transferred to Davis-Monthan AFB for storage, Dec. 1957. 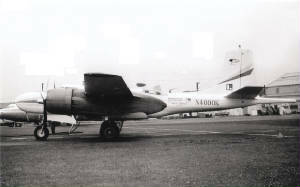 Kreitzberg Aviation, Inc., Salem, OR, 1966. 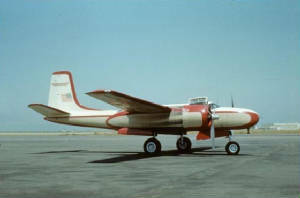 Aero Union Corp, Chino, CA, 1969. 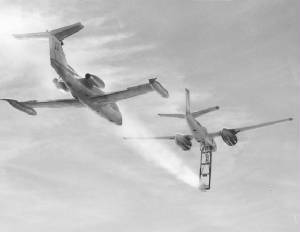 - Converted to air tanker configuration. 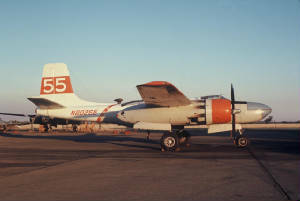 - Flown as tanker #55. 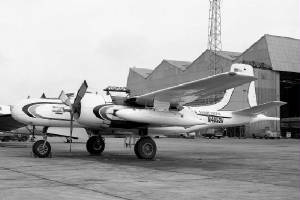 Conair Aviation Ltd., Abbotsford, BC, May 1970. - Flew as tanker #C55. William Dempsey, East Wenatchee, WA, 1977. Lester Riley, Anchorage, AK, Circa 1978.
on frozen rivers to aid in ice breakup. 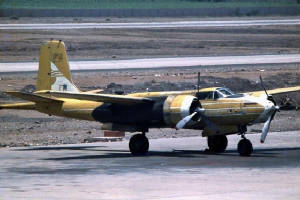 - Also used as fire bomber. Dr. Don Rogers, Anchorage, AK, Circa 1979. 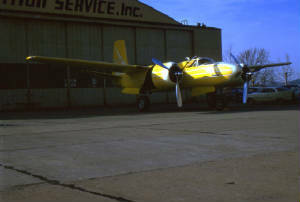 - Flown as "435323/Ginny Sue. 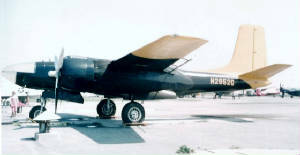 The Air Museum/Planes Of Fame, Valle, AZ, 2002. Those wing pods were a lot more than flare holders. They originated a whole new way to instrument an aircraft. 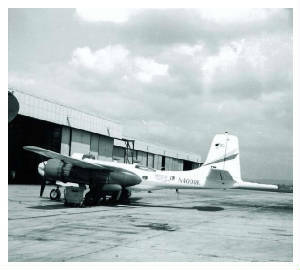 All prior instrumented aircraft had the instrumentation specially built into the plane. Instrumentation in those days was analog and took a lot of calibration and debugging. When the instrumentation is built in then the technicians must do all their calibration and debugging inside the aircraft. It was slow and tedious and usually did not work. I changed all that by having the technicians, headed by Paul Lage shown in the orange sweater alongside Larry Rea, build everything in the lab rather than in the aircraft. 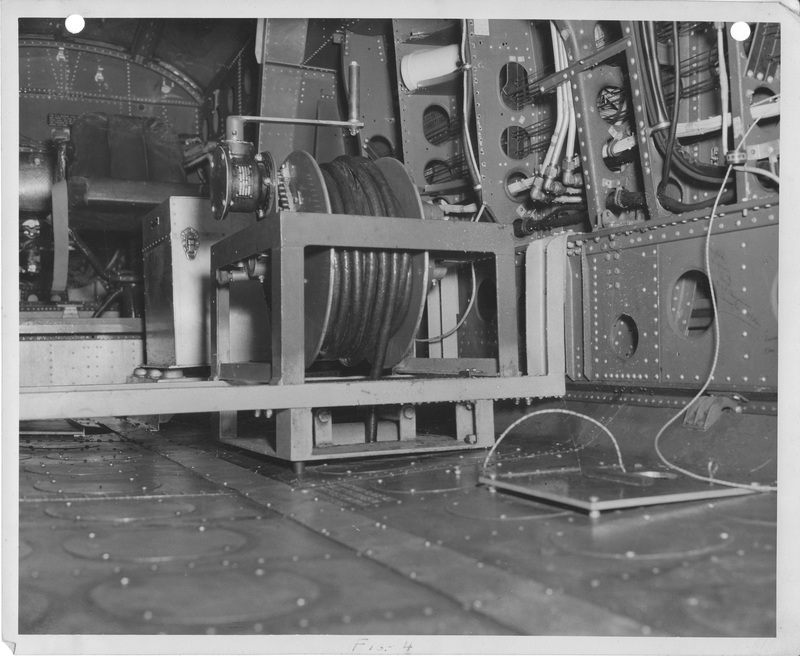 There was the electronics package in racks that could be quickly mounted on the floor inside the aircraft, the instrument sensors mounted on the two pods made from former fuel tanks, and the cabling between them. The trick was to have the technicians build two exact copies of the cabling: one for the lab and the other for the aircraft. 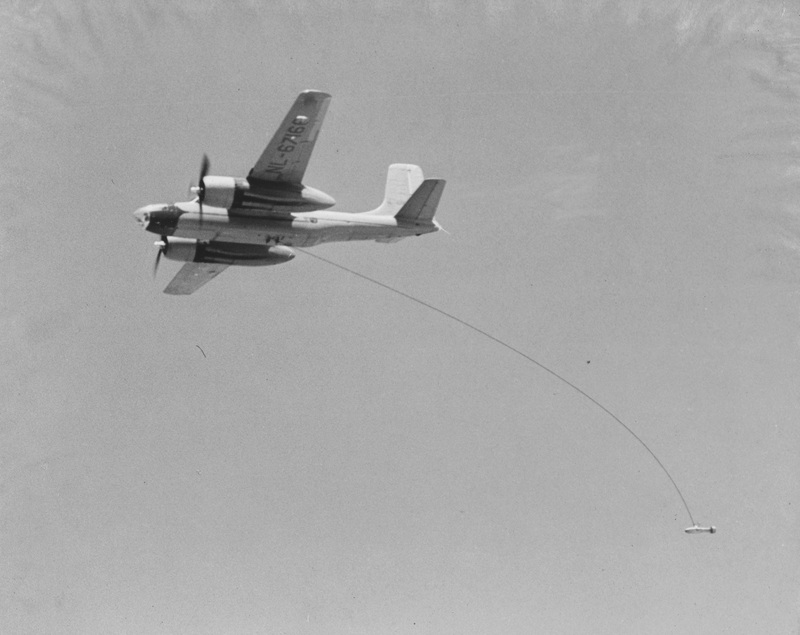 When the two cabling units were fully calibrated, one of them was installed in the aircraft running from the cabin to the instrument pods. The other remained in the lab to be used for calibrating and debugging the instruments. It worked like a charm. 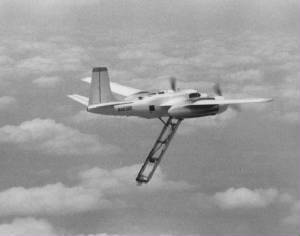 When ready for a research flight, we simply moved the package and the pods from the lab to the aircraft. 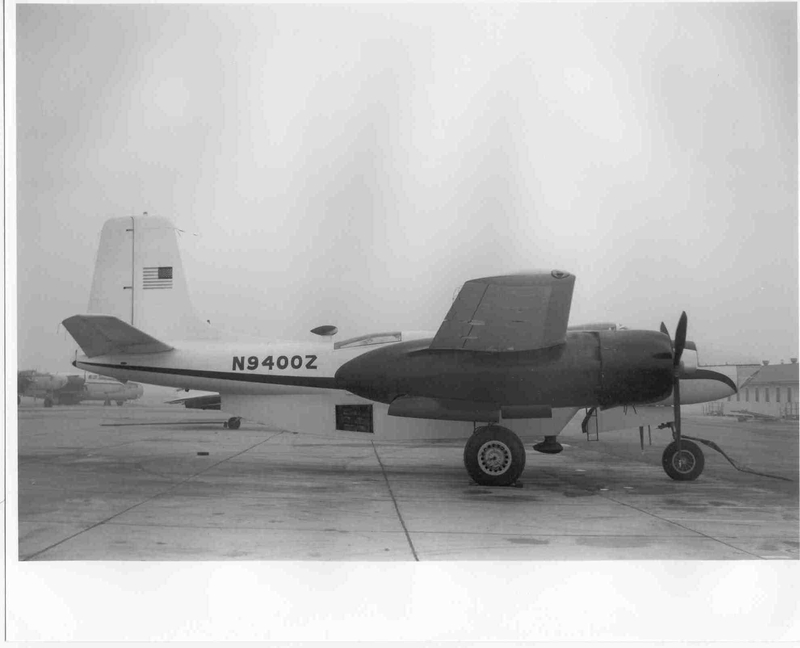 We never had an instrument failure during any flight. The weather radar is the first ever aircraft radar to paint a picture referenced to the ground, and this was long before GPS made it easy. We would make a copy of a sectional map on clear plastic and mount the plastic map over the storage scope shown here. We used a local Vortac as a point of reference. We could dial the position of the Vortac on the scope and then position the map. Then our analog computers would add aircraft heading to the radar angle with respect to the aircraft to get north orientation. Then our analog computers would add our position according to the Vortac and put the north orientated radar signal on the scope. Viola, a ground position radar. Finally, we could keep track of our position with respect to clouds. We could seed a cloud and fly back into the area we seeded. We could watch clouds moving. This was my own invention. 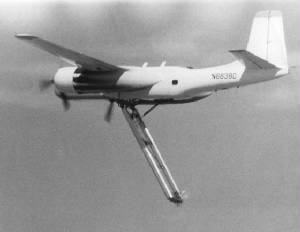 I helped the Air Force use this concept for their hurricane monitoring. 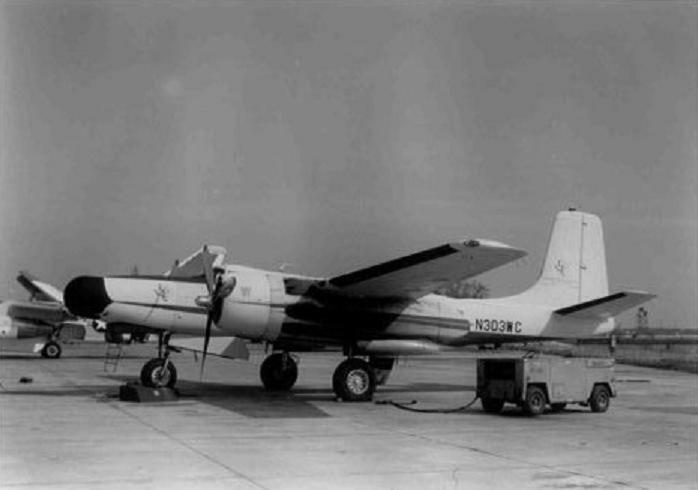 They had been using rotation radar antennas on top of aircraft to look at the hurricanes, thinking they needed to rotate the radar to get a picture. Add a piece of information: the larger an antenna the better the radar image. The problem then is how do you put a larger antenna on an airplane and still fly the airplane. Simple. Replace the large door on the side of a C-130 with a radar antenna mounted behind a new door made of radar dome material. Now, to get a picture of a hurricane simply fly a 360 circle and use ground positioning of the signal, like we did on the B-26, to paint a ground referenced high-resolution picture. It worked like a charm and produced the finest hurricane radar picture ever at that time. In March 1980 the plane went down between Lake Tahoe and Sacramento. Ed no longer worked for DRI. All four crew died in the crash. Crash reports are unclear whether icing or mechanical breakdown caused the crash. 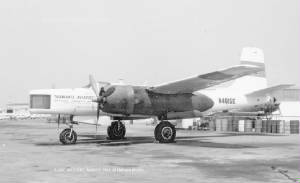 Ed states: I am convinced the B-26 went down because of ice for two reasons. First, we encountered icing on a few of our flights through Sierra Nevada winter storms. 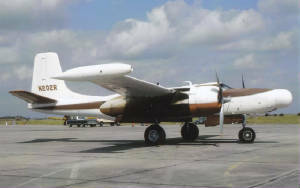 I know how the B-26 can be overwhelmed by ice. Its inflatable boots on the wing leading edges were not able to remove ice as fast as it can build up. 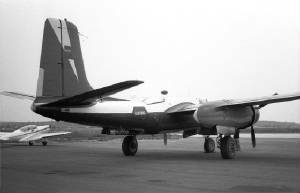 In both the B-26 and the C-45 we hit ice that caused loss of altitude. We could have crashed. It was dangerous work. Tom Wells always had a plan that saved us for another day. He had a way of following the low terrain when we could not maintain altitude until we were low enough so the ice would melt. The second reason is the report of an eye witness to the crash. 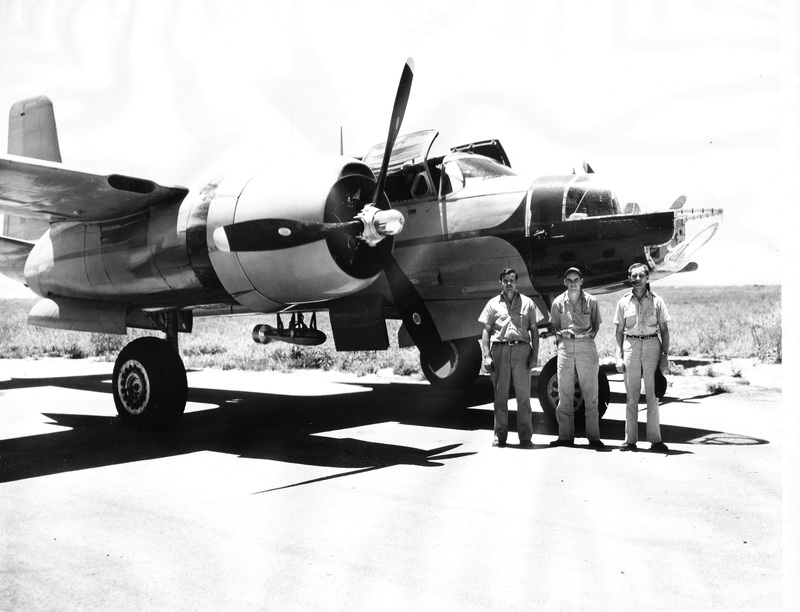 He said the B-26 rolled over as it came out of the cloud. This is caused by having ice. Ice increased the stall speed and ice can break off one side before it breaks off the other side. When ice is bring a plane down any attempt by the pilot to pull back the elevators too much can cause the plane to stall. In icing it is very likely one wing will stall before the other wing. This would cause the plane to roll, as reported by the witness. L. B. Smith Aircraft Corp., Miami, FL, 1960. - Acquired from USAF disposal, Hanscom AFB, MA, Nov. 27, 1957. - Rebuilt as prototype for Smith Temp I & II. - Test Flying, Miami, Oct. 1959-1962. 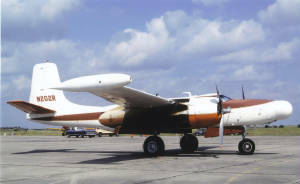 Pinellas Aircraft Inc., St. Petersburg, FL, Mar. 7, 1963. Appliance Buyers Credit Corp, St. Joseph, MI, Apr. 18, 1963-1966. 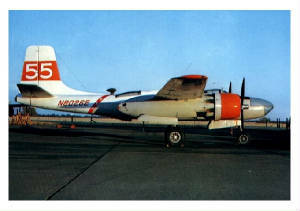 North Phoenix Aviation, Phoenix, AZ, Nov. 1966-1967. A. Newton Ball, Dillingham, AK, Jan. 1, 1967. Robert L. Carleton, North Hollywood, CA, Feb. 23, 1967-1968. University Of Nevada, Reno, NV, June 12, 1968-1980. 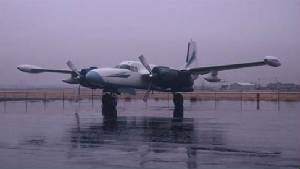 - Stalled and Crashed due to airframe icing during weather research flight, Georgetown, CA, Mar. 2, 1980. DAMAGE-DESTROYED    OT-  0  0  0                            INSTRUMENT RATED. WEATHER - ICING CONDITIONS-INCLUDES SLEET,FREEZING RAIN,ETC. REMARKS- ATMOSPHERIC RESH.ACFT NR AFT CG LMT,NO LONGTDL STABLY STUDY.O/B INSTRN INDCD IN ICG CONDS 19.5MIN.